Here's Alice, and isn't she adorable? 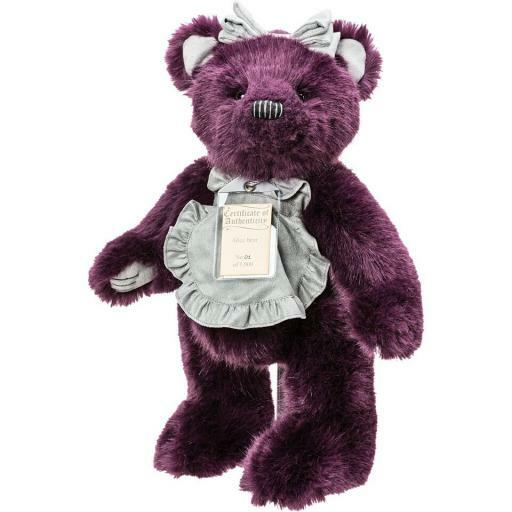 She's unusual in that she has a gorgeous rich mulberry plush, and a complimentary silver and black embroidered nose. She is wearing a silber-grey frilled pinny, and a matching headband. She has defined fingers and toes. As with all the Silver Tag bears, Alice is fully jointed, substantially weighted, and has a classic hump. Alice comes with an individually numbered Certificate of Authenticity. She is 46 cm standing. Alice is one of 1000. She can be spot cleaned.